Finnish rock band The 69 eyes are back with their tenth studio album - X. The band formed in 1989 and released their first single the following year, with their debut album (Bump'n'Grind) coming in 1992. In the early days they had a Glam/Sleaze sound, but over the years this has changed as more Gothic influences have been incorporated. 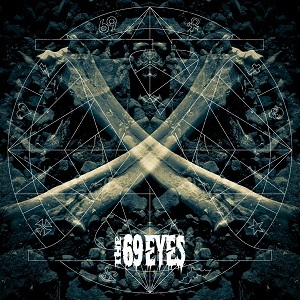 I must admit that despite being aware of The 69 eyes for some years, I'd never actually listened to them until I was given this album to review. The album starts with "Love runs away". It opens with powerful guitars before the vocals kick in. I must say that my first action was to check the band's lineup to see if it was Billy Idol singing - The 69 eyes singer Jyrki 69 really does sound like Billy Idol in this song. It's a great rock song, and one that you could certainly imagine Billy Idol singing, so the similarities are more than superficial. A great start to the album. "Tonight" is another great song. It's got a faster pace, a good chorus and is just a great song all round. From listening to the album, the vocals have more than a hint of Billy Idol, but musically The 69 Eyes are darker, and sound to have been heavily influenced by bands such as The Mission. So, vocals like Billy Idol, and songs/music that sounds to draw from Billy Idol and The Mission - now that's a good combination. Obviously The 69 eyes arent just influenced by those two bands, but those are the influences that come through most strongly when you listen to the album. A great album that's well worth a listen. X will be released on 28th September 2012 via Nuclear Blast.